The Walpole and Medfield High girls met on the hardwood last Thursday night in Walpole for their one and only meeting this season. Behind a game-high 22 points by junior guard Elisabeth Roche, the Lady-Rebels (7-6, 4-4) earned a huge 60-53 non-conference victory. Another big storyline for Walpole was the return of star point guard Sydney Scales (nine points), who missed the last couple of games due to an ankle injury. Sophomore forward Camilla Silk led Medfield with 15 points. Junior forward Ceanna Kinney also finished in double figures for the Warriors, notching a double-double with 10 points and 16 rebounds. The teams traded blows throughout the opening quarter, with Walpole jumping out to 15-10 lead at the end of one thanks to layup just before the buzzer by junior guard Ainsley Dundon (eight points). Walpole began the second quarter on a 5-0 run, thanks to a three-pointer from Roche and a layup by senior forward Jill White (13 points, 11 rebounds) to take a 20-10 lead. The Rebels maintained a 10-point lead at 26-16 before Medfield responded with a 14-6 run to close out the quarter, highlighted by a three-point play from Silk on a drive to the rim-and-one. Walpole clung to a 32-30 lead at halftime. Medfield began the second half the same way they finished the first: giving the ball to Silk and letting her score. 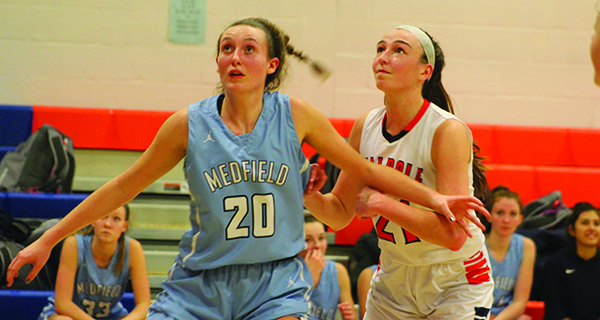 The sophomore banked home a layup to even the game at 32 before senior captain Erin Seibel drained a three-pointer to give Medfield its first lead of the contest at 35-32. Following the made three by Seibel, Walpole called a timeout and made some adjustments. The timeout proved to be pivotal; Walpole responded with a 13-1 run to close out the third quarter, highlighted by a pair of three-pointers from Roche. The Lady-Rebs led by nine at 45-36 entering the fourth. Walpole extended its lead to as many as 16 points at 52-36 following a 7-0 run to begin the fourth quarter. Medfield responded with a quick 6-0 run to cut the deficit to 52-42, but Walpole continued to pressure the Warriors hard and defended their bigs extremely well under the rim. Medfield cut the deficit to seven late but that’s the closest they would get. Walpole emerged with the 60-53 victory. 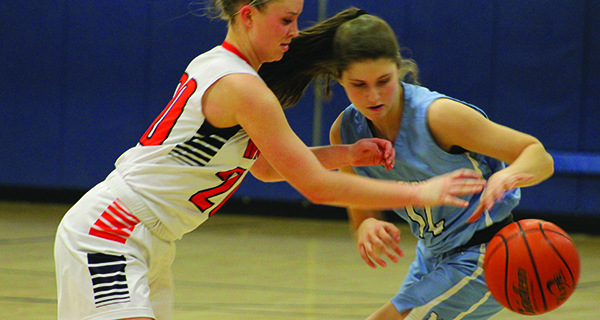 The Lady-Rebels will look to stick to their winning ways when they host rival Norwood on January 31, while Medfield will try and get back on track against Holliston on February 1.